This is an organic tomato ketchup with a fiery trick up its sleeve. Packed full of rich and vibrant organic Italian tomatoes and a hint of spice, this all natural tomato ketchup goes with just about everything. 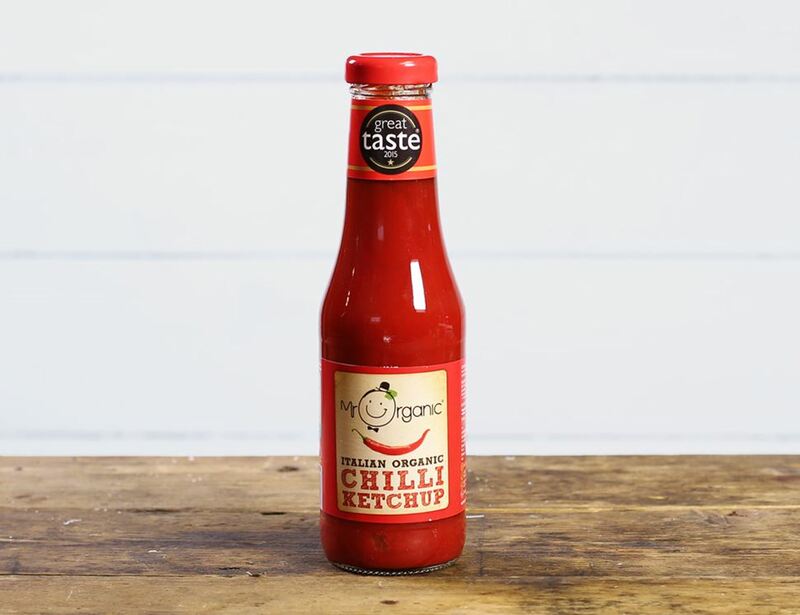 This chilli tomato ketchup is produced by Valerio, Kostas and Carlo - three friends with passionate belief that well-being starts with good honest food. Kostas says ‘That's why we are always mindful of our ingredients and work closely with our farmers and producers to provide sustainable, wholesome and delicious organic food that makes people healthy and happy!’. From store cupboard staples to speciality goods, Mr Organic is making it simple to choose a better, more wholesome way of living. Italian tomato* (81%), Sugar*, Vinegar*, Curry*, Onion*, Chilli*, Turmeric*, Paprika*. * = produced to organic standards. For allergens, including cereals containing gluten, please see ingredients in bold. Suitable for vegans. Store in a cool, dry place away from heat. Once opened keep refrigerated and will remain sumptuous for a further 8 weeks. Not suitable for freezing.